Phil and Tony Esposito, Paul Henderson, Ken Dryden, Frank and Peter Mahovlich, Ron Ellis, Yvan Cournoyer, Rod Gilbert, Bobby Clarke, Guy Lapointe, Stan Mikita, Brad Park - these are some of the Team Canada heroes who struggled mightily to defeat the Soviet Union's formidable superstars. For most of September 1972, Canadians were riveted to their television screens in what became one of the most-watched events in Canadian history. At first, in Canada, the Canadians floundered so badly, losing two games and tying one, that it seemed impossible to overcome the embarrassment of total defeat. But in Moscow, after losing another match, Team Canada turned the tables on the Soviets, winning an amazing three games in a row to take the Summit Series. 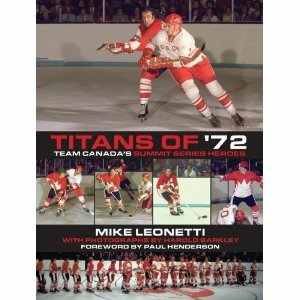 Now, in Titans of '72, bestselling author Mike Leonetti tells the stories behind each Canadian on that fabled Team Canada, including those like Bobby Orr who didn't actually play. Accompanying Leonetti's portraits of these genuine Canadian heroes are superb pictures by Harold Barkley, a photographer who pioneered the use of stop-action colour photography in hockey.